My boyfriend carried her home in one hand through the Barcelona metro. She was too young to leave her mother, but she came from a farm in the foothills of the Pyrenees, and the farmer had no interest in feeding puppies any longer than necessary. Was she even real? She could have been a toy – a fluffy ball of black and white, with dark eyes that were far too wise for a body so little. In hindsight, her mother was probably a Great Pyrenees and her father a Border Collie (two breeds which often work together to guard and guide flocks of sheep, among other livestock). But at the time we thought: Mountains? Big? Black and white? She must be a St. Bernard. So in homage to the little-flasks-of-cognac iconography particular to that breed, we began to scroll through names representative of alcohol (wouldn’t anyone? ), and eventually arrived on Johnnie. Johnnie Walker. Johnnie Walker of the perpetual walkabout. The name was prophetic, because few dogs have travelled as much as she, and even at home she had a wanderlust that sent her escaping into the great, wild unknown. Spanish tile and long hallways = fun! Traditional apartments in Barcelona run the length of a building, so our home must have seemed like a palace to her at the time. But when she was seven months old it was time for her second move: this time, to Seville. It was an effort to improve our financial situation that promptly lightened our pockets even further. The only way to transport a dog on Renfe, the Spanish train system, was to purchase an entire first-class sleeper compartment. Her Majesty boarded in fine style, none the wiser. In Seville her situation changed drastically, and it’s something that pains me to this day. 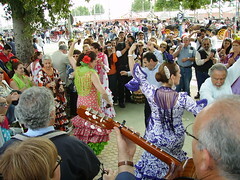 Not only did we arrive at the busiest time of the year – the streets were filled with incense and parading saints during Semana Santa and twirling flamenco skirts that accompanied foot stomping and shouts of revelry during the Feria de Abril – but the job that had lured us came to require twelve-hour shifts. Our hosts, who were also working long days, understandably did not want a crazy puppy tearing up the apartment in their absence. Johnnie was relegated to the bathroom each day, with only a brief, mid-day break during the lunch hour, and naturally began to demonstrate destructive, crazy puppy behavior. At night, when we were exhausted and trying to sleep, she wanted none of that. It was playtime, and I would fall asleep as she initiated tug of war with my socks. In fewer than two months, when we saw our schedules weren’t merely a temporary, high-season blip, we knew it was time to leave. This time, we were headed to the Balearic Islands. There was only one problem: the ferry. It turns out that Trasmapi, the ferry company, had a dog policy similar to that of Renfe. Taking the train and then the ferry, renting first-class cabins on both, was not an option. So we did the next best thing: we bought a car, which she could stay in during the ferry ride, and which we could then resell on the island. Yes, we bought a car, in order to transport a dog. A very, very special dog, who had just survived puppy hell. But on the island, Johnnie found the Promised Land. While we ran a beach restaurant, she was free to roam the sand dunes. I would see her, in true Border Collie fashion, running up and down and back and forth, barking and herding her imaginary flock. Sometimes I couldn’t even see her, just an explosion of sand as she jumped and dove. Other times she would rest for hours on the highest dune, surveying the tourists below as if they were grazing livestock. She was the tourists’ mascot, and they all spoiled her terribly. For food, when she wasn’t eating treats from their picnic baskets, she ate leftover table scraps from the restaurant, like any other Spanish canine (her favorite was chicken soup). In the middle of the day I would take a break to swim in the transparent Mediterranean. She would follow me out past the sand and onto the rocks, hoping to synchronize her dive with mine, but I always made her wait to avoid surfacing to the unwelcome scratches of a paddling dog. She would sit, whimpering, shifting from paw to paw, as if being deprived of the greatest possible pleasure. Then she would jump in with a joyful belly flop when I called her name. To avoid her paws, I would outswim her, or dive below, where I would hear her barks below the water. “Not fair! Not fair!” she protested. You might assume her energy would be entirely spent on those dunes, and that in the evenings she would rest calmly. You would be mistaken. The imagined delights beyond our fence were too much temptation for this curious soul. I make light of it now, but it scared me to madness at the time. The islanders rarely kept dogs as house pets, and if one were spotted too near a chicken coop, nobody would think twice about raising a gun. One day I looked up from doing dishes and realized she wasn’t there. Oh yes, she was stealthy, that one, and managed to outsmart each successive barrier we erected to bar her escape. My go-to “find her” spot was the cabin of our small van, called a furgoneta. Few things were as exciting as taking a drive, and if she snuck away I could often find her there, always hopeful of a new adventure, ensuring she wouldn’t be left behind. Sometimes I would hear a stifled “Woof! Woof!” and know it came from inside that cabin, as she chased her tail or signaled to me that it was time to leave. But that day, she wasn’t there. Next, I called for her. Not one to miss out on the action, it would often work. Not today. I felt my heartbeat accelerate. I walked up and down the dirt lanes of the farmland where we lived, trying to strike a balance between whistling with enough volume that she would hear me, but not enough to rouse the suspicion of the locals. Bend after bend, I crossed my fingers and hoped to see her fluffy tail bobbing above one of the rock walls in the fields … but no. And then, far in the distance, I heard barking. Very faint, but it was there. I followed the sound, quickening my pace as it grew nearer, until I passed a stone house and saw it. Saw her, Johnnie, and that poor, terrified goat. She wasn’t getting into mischief with chickens; she hadn’t been shot by a farmer. Instead, she was trying to herd a neighbor’s goat, and was so absorbed in her raison d’etre that she was deaf to my whistles. Delighted to find an animal to herd, unlike those unresponsive humans, she must have begun barking at the goat’s heels. At which point the goat, not at all happy with the situation or interested in being herded, ran straight to the top of a woodpile. And there ensued the standoff: Johnnie on the ground, paws pushed forward and shoulders lowered as she barked her heart out, determined to make her daddy proud, and on top of the woodpile, a frightened goat, shaking on its spindly legs. She usually assumed the role of lead dog in her herding routine, and put on a hilarious act of being in the know even when she had no clue where we were headed. If I called to her and flung my arm out in one direction or the other she would follow that lead, but she would never deign to actually look up and request guidance. When my mother came to visit we set a small trap. As we approached a T-stop, we shortened our pace; sure enough, Johnnie became utterly absorbed in a tuft of grass at the corner. We began to turn left, and she scampered off ahead. “Come this way! Quickly!” I whispered, gesturing to the right. We glanced back, and Johnnie was momentarily oblivious, happily “in the lead,” paws prancing lightly and tail bobbing above. Until, suddenly, she realized she wasn’t. She took off towards us at breakneck speed, her paws a blur as she zoomed past. Then she came to an abrupt halt, fifteen paces ahead, and continued along tranquilly as if nothing had happened, pointedly ignoring the sound of our laughter. Several years after college graduation, it finally seemed time to head home to the U.S. We took a roundabout route to the airport in Madrid, travelling almost the entire country of Spain in a six-week road trip in the trusted furgoneta. Murcia, Jaen, Andalucia, Salamanca, Extremadura, Galicia, San Sebastian, La Mancha … few stones were left unturned. We stayed mostly in paradores, castles renovated as hotels and run by the Spanish government, or pensiones, small family-run guest houses. When dogs weren’t allowed, Johnnie got the furgoneta all to herself for the night. In Seattle, with my parents, she found subjects who would finally accommodate the lifestyle she deserved and to which she would soon grow accustomed. She ate premium dog food, which made her coat glossy. She visited the groomers, and had the burs removed from her long tail fur. She was rewarded with doggie treats just because she raised her ears and cocked her head. She went on long, steep hikes through ancient rain forests. She found neighborhood dogs to herd, and squirrels to chase. She was allowed in the kitchen. And when it all got to be too overwhelmingly wonderful, she could curl up in the open back of the SUV and watch the world go by, just like in the old furgoneta. When I moved to New York later that year, I expected to send for her in a short matter of months. I underestimated the difficulty of finding apartment buildings and roommates that accept 60-pound dogs. In movies, everyone in the city has a dog. Even more importantly, I forgot that I was now stepping out of the role of wandering hippy and into the role of solo working girl, with its accompanying long New York hours. Each time I visited Seattle, speaking the old Spanish terms of endearment that elicited a furiously wagging tail and sloppy doggie kisses, I thought back to those rough months in Seville. I couldn’t bear to let her revisit them. And given the choice, even though it bruised my ego to think it, I knew she wouldn’t want to give up her happy days of structured routine and endless pampering, either. In the end, she never made the journey to New York. Or Miami, or Texas, or Germany, or any of the other places I lived and traveled. I wondered if, unlike me, she had exorcized her travel bug in the early years. She seemed completely content surveying the neighborhood and making sure all was well in her tiny domain. She even stopped running away from home. But in hindsight, I have to wonder if her name ever even was prophetic, or if her apparent wanderlust was just a projection of what I hoped for in a companion. And Johnnie, faithful and loyal companion that she was, happily obliged. I’m continuously drawn to this memoir of a beloved companion. Somehow she always seemed to know that she was cute, too. Smartest dog that ever lived, I tell you. Truly, a relationship to cherish. Sigh, I was feeling blue, so I needed a Johnnie fix. She was so special. I’m looking at getting one of these mixes now. Yours looked really sweet with those Pyr eyes. We have a full Pyr and shes’ so emotionally empathetic and smart. We are wanting to get her a a sister. HAHA. I’m researching now to see what others thought of this mix and over all its unanimous they are awesome. Thanks for the info.